The House on the Hill Blog – Page 19 – Renovating a house from the 70s in the South. 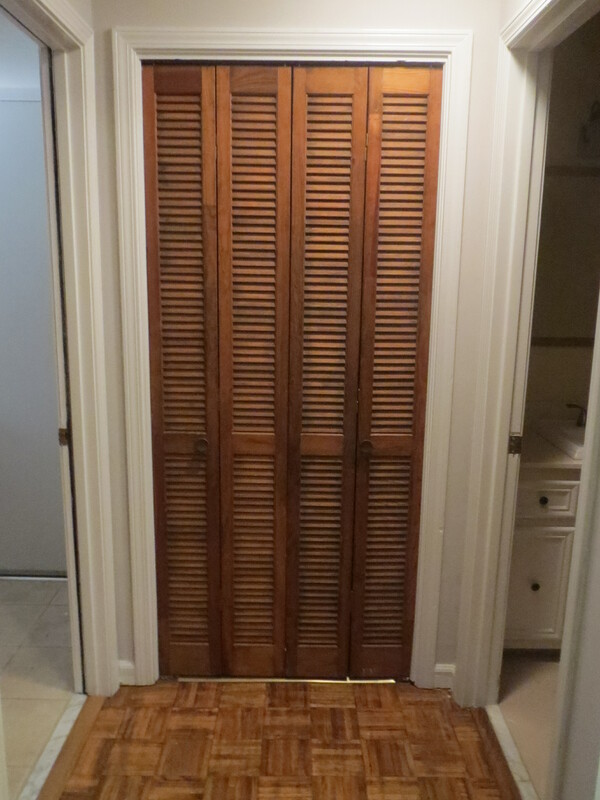 I decided that instead of a closet with ugly brown bi-fold doors, it makes the most sense for us to have a “landing spot” to toss shoes and hang our keys. I really wanted to use the laundry room for that but it’s too small already and adding hanging coats and a place for shoes would make it unbearably cramped. We already have to do this weird tango when we’re both coming in or out! 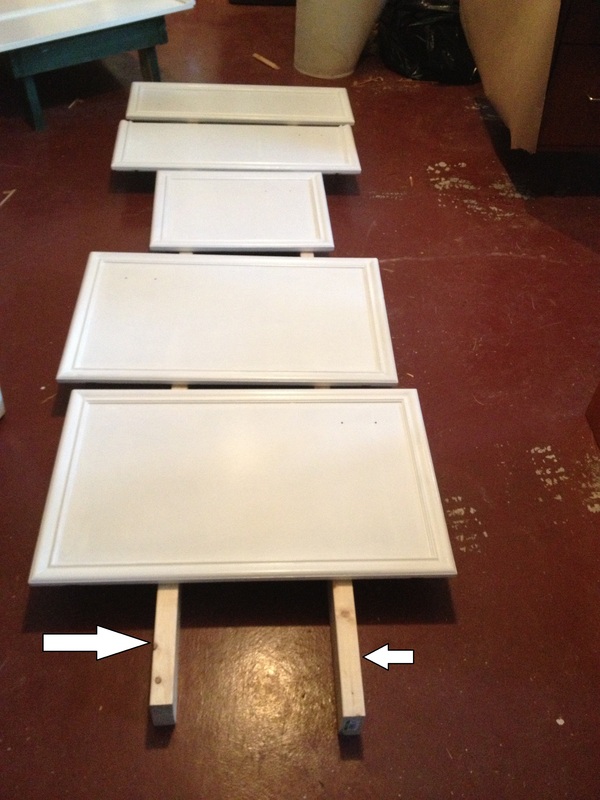 This is just part one – building a bench where we can sit and put on/take off our shoes. I’ll also be building a wooden crate that will slide in so our shoes will be hidden and I won’t have to worry about tripping over them. This project really tested my skills and patience what with it being the first thing I’ve ever built besides a desk and bookcase from Walmart. It was also my first time using any kind of saw and I’ve got to say, I’m already feeling it. I’m sure I’ll be sore all over tomorrow but for now I’m incredibly proud of myself for doing this about 99% by myself. I’m also super thankful for the tiny bit of help I did get from Kyle though or else I probably would have ended up sobbing in a corner. Now I’m going to reward myself with a cookie and an episode of Deadliest Catch. 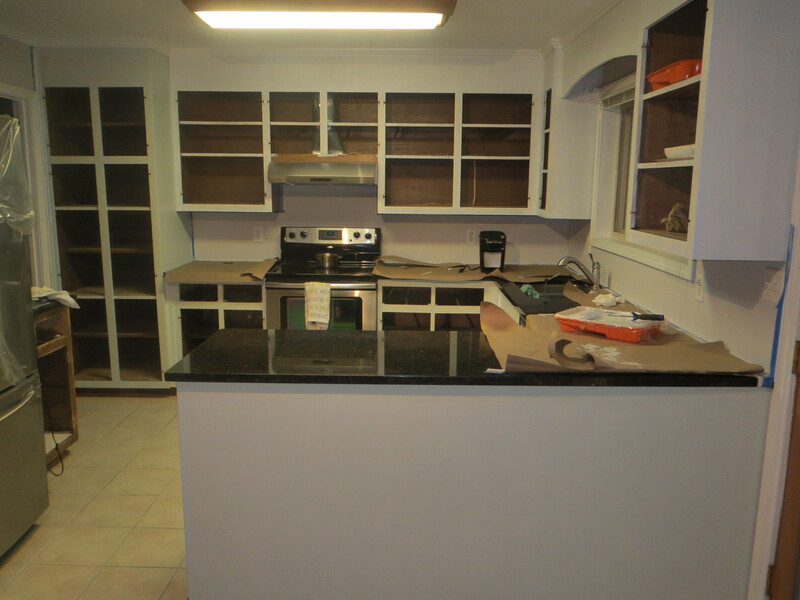 That’s right, we are DONE painting our cabinets! Of course we still have to tackle the drawers but there are far fewer of those and they’re much smaller. I plan on posting again later today but was too excited not to share the news! It’s recommended that you let them dry for about a week before hanging but we’re going to see how they feel on Monday or Tuesday and go from there. This project has been a pain but it’s going to be so worth it once we get those pretties into place! Oh where, oh where have my 2x4s gone? So a funny thing happened last night. It was at that moment that I realized we were using them to help us paint and dry the cabinet doors. Have you ever searched tirelessly for something that was literally right at your feet/in front of your face? 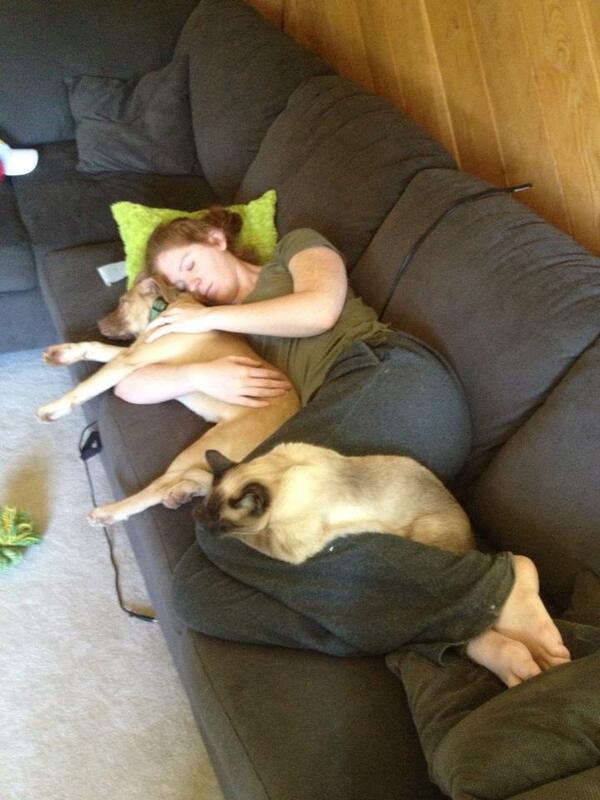 You know those “big plans” I had for the weekend? 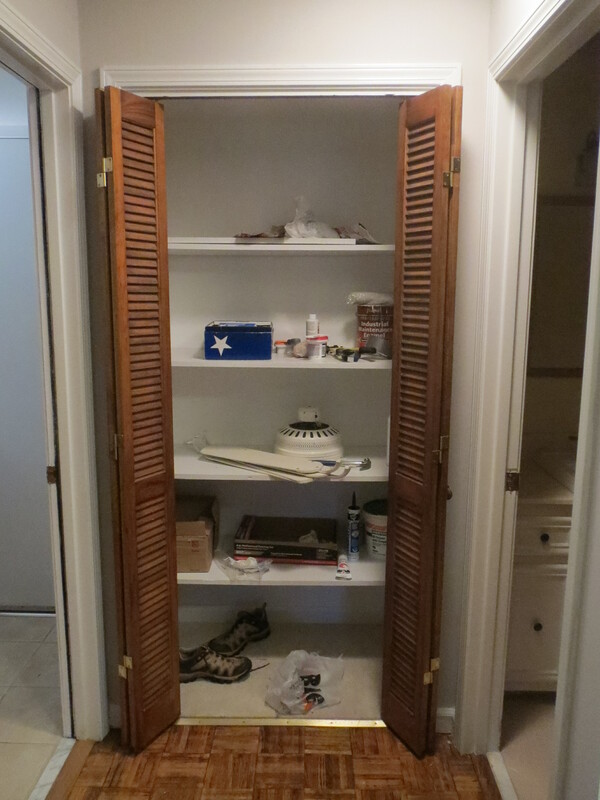 Well, let’s just say the closet looks the exact same as when I last showed it to you. 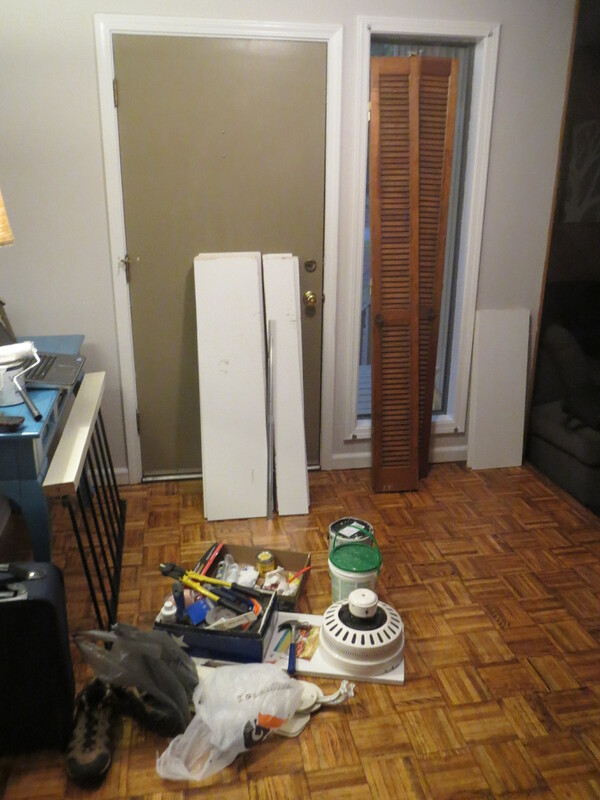 We’re going out of town tonight but our new plan is to work on the cabinet fronts and the closet after work tomorrow. This will push back finishing our cabinet project until Wednesday of next week but we should have a few projects in between now and then to show you. Have you ever had one of those days where you throw your plans out the window and just laze it up instead? Well that’s a bit dramatic. It was a lot less like demolition and much more like disassembling. Confused? Allow me to explain. 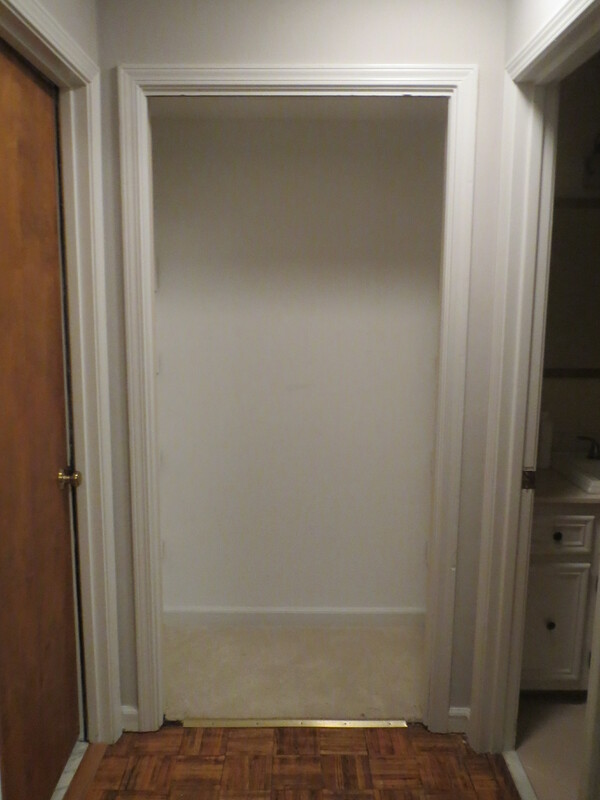 That my friends, is the hall closet in the front entry. Not the prettiest girl at the ball if you know what I’m sayin’. 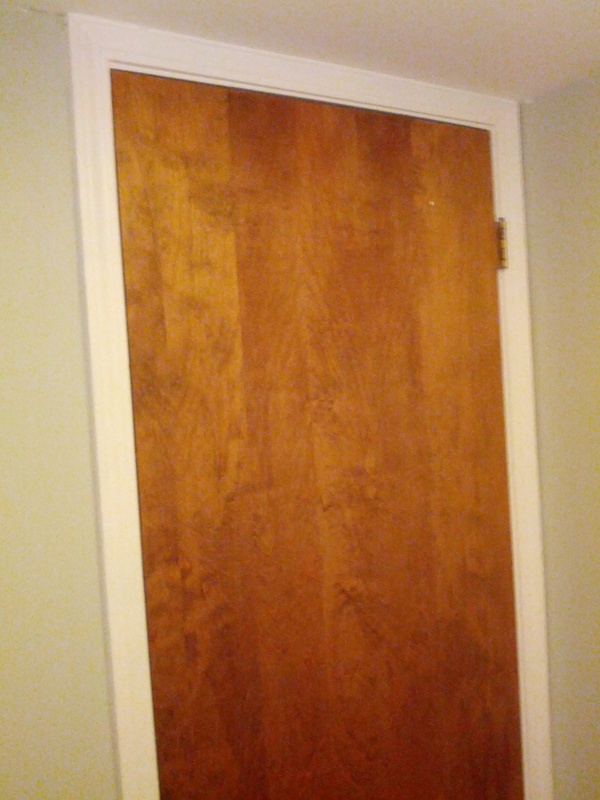 Let’s take a look behind Door Number One, shall we? And by car, I mean house. 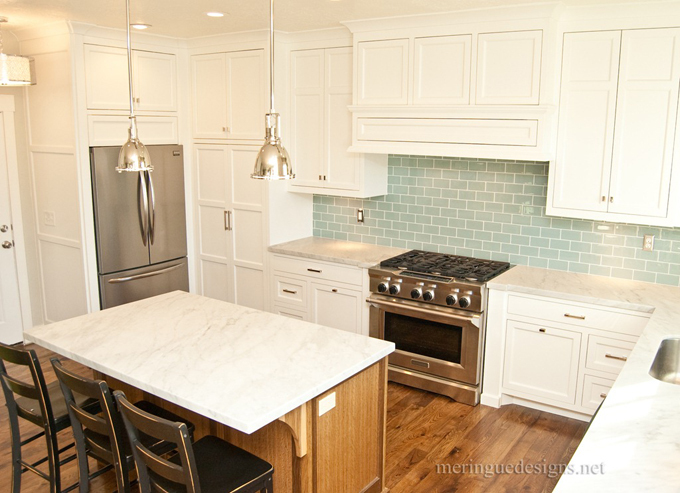 Seriously though, I have been absolutely drooling over white kitchens for the longest time. Sometimes I day dream about them…that’s a little weird but hey, we’re all a little weird sometimes, am I right? I don’t know what it is about a white kitchen, maybe how clean they look or maybe it’s how open and airy they seem to make a room feel. Whatever it is, I want it. Who wouldn’t want to cook in one of these beauties? 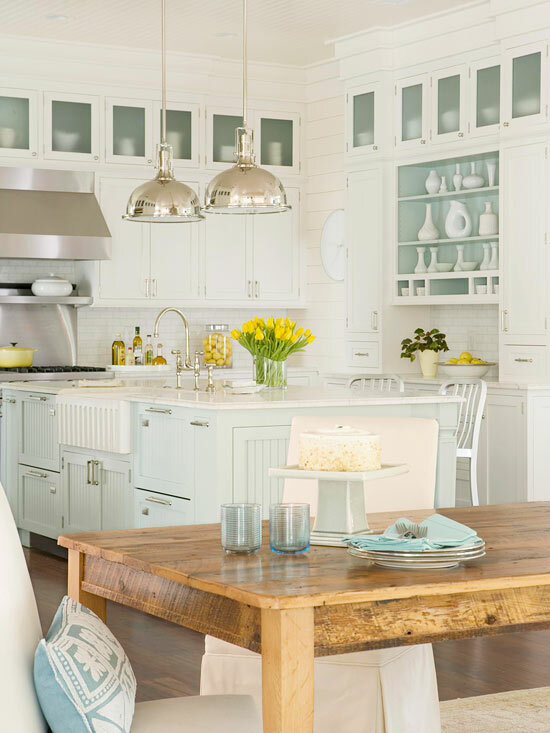 These are just a few of the hundreds of white kitchen pictures that I’ve been ogling lately. 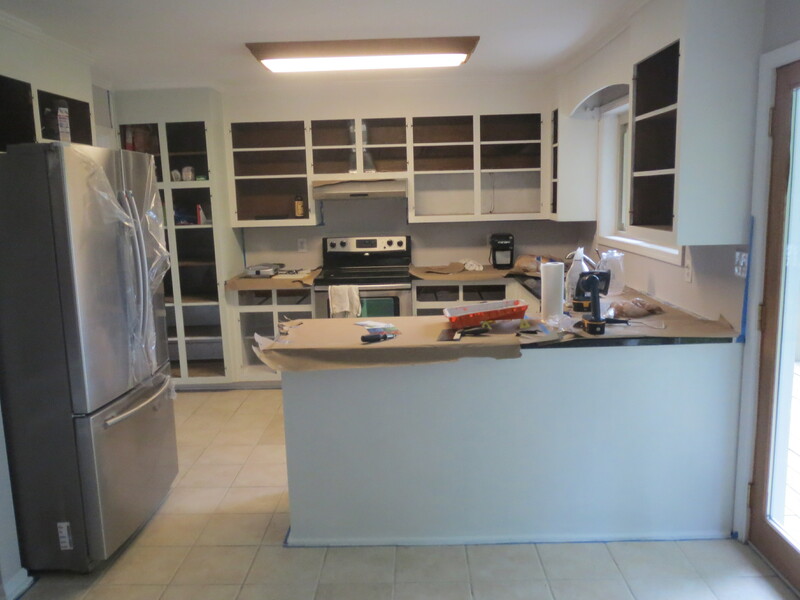 Keep in mind that for now we’re just painting the cabinets and then we’ll move on to installing a backsplash, adding new lighting, and maybe one day we can even expand our space a bit (or maybe that plan will just have to stay in my dreams forever). Anyone who knows me knows (or should know) that I absolutely love to bake and I’m stupid excited to have my own little corner of the kitchen. 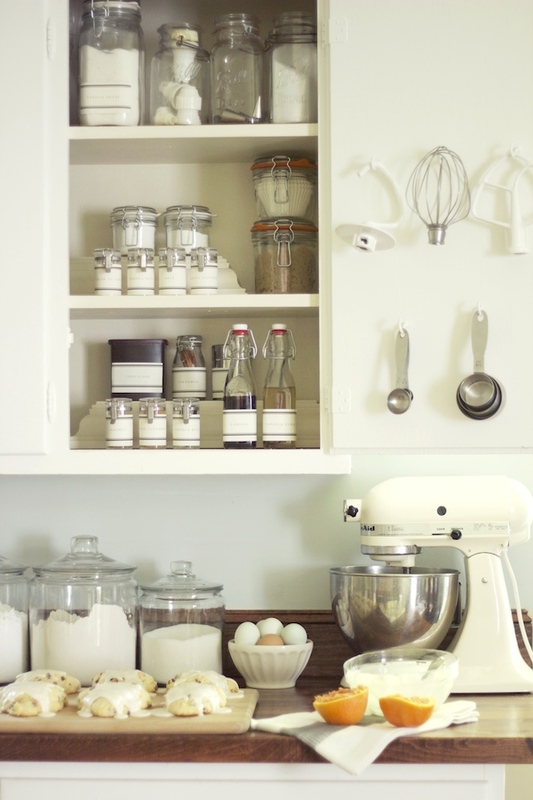 Jenny’s baking station is not only gorgeous but functional and incredibly organized which I love. Progress has slowed a bit in the kitchen since Kyle is out of town for a work trip but we should have all of the painting done this weekend which means next weekend I’ll be able to do the cabinet reveal! Until then, I’ll just keep getting some inspiration from my BFF. 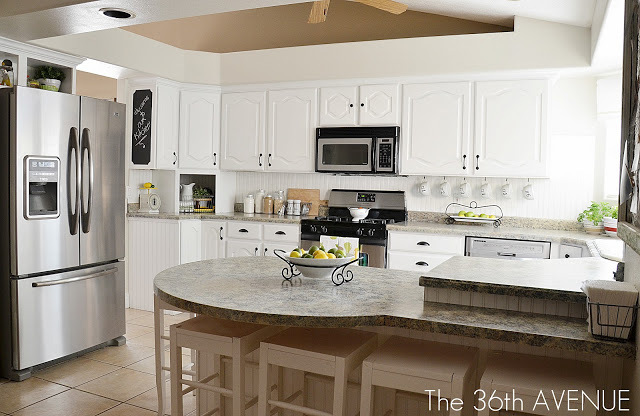 What do you think about white kitchens? Too trendy? Classic? Boring? 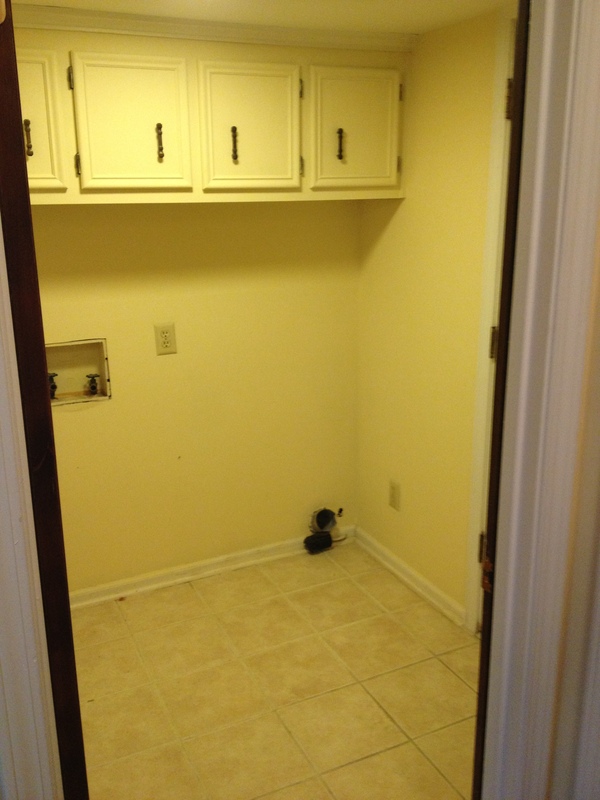 So if you’ve been following along, you know that we gave our laundry room a face lift and that we’re currently working on phase one of our kitchen. You can also see from what I’ve posted on the House Tour page that our house could use lots of updating. I thought it might be helpful for you guys if I posted a “to do” list of sorts – giving an overview of our master plan. Now, I love a good list – seriously, next to spreadsheets, amortization tables, and DIY projects, a list of any kind is my all time favorite thing – but I know that too many boxes to check off can be overwhelming for you and me both…but mostly me. 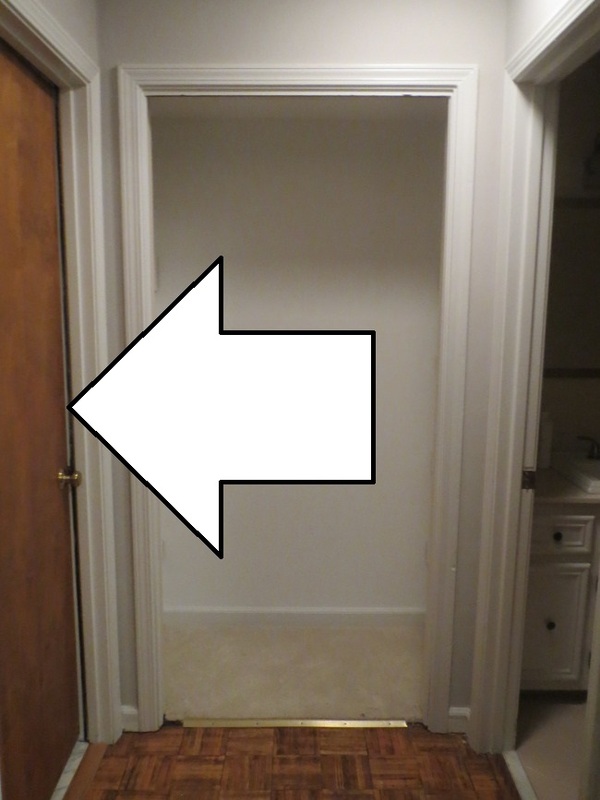 So to keep you guys from dozing off (and me from having to check myself into a mental facility), I’m just going to do a broad plan for “Part One” of our whole home makeover which focuses on the downstairs. Phew! I’m worn out just from typing that list. We don’t really have a deadline for any of this, we’re just trying to do what we can as we have the time (and dolla’ dolla’ bills, ya’ll). What do you think? I didn’t want to go into too much detail but I promise that I have some exciting plans for these spaces! Next time, I’ll share a little bit of the inspiration behind our kitchen plans and hopefully the reveal isn’t too far off. 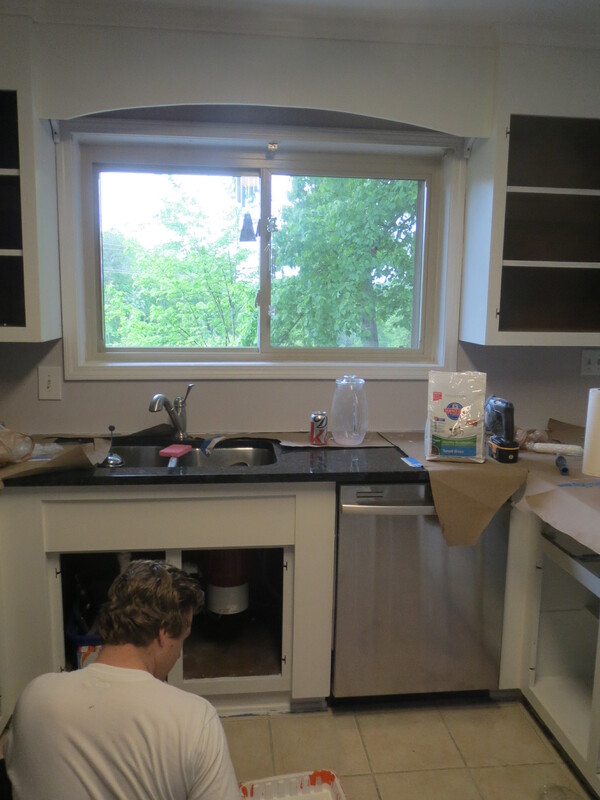 Once upon a time, we decided to do a “quick” kitchen makeover. 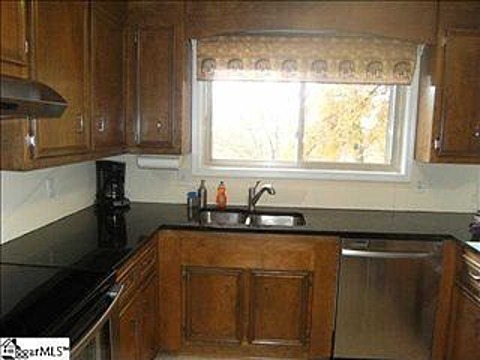 You know, just slap some paint on the cabinets and throw up a backsplash, no big deal! Now, we look back and laugh and laugh and laugh at how naive we were. “Quick” has now turned into 5 1/2 weeks of not doing much. Let’s take a trip down memory lane, shall we? We were able to get all of the doors down that night but since then, life has gotten in the way and we’ve only been able to work sporadically. It’s tough to muster up the energy and motivation to work on kitchen cabinets after you’ve both been working all day and we’ve spent far too much time at home improvement stores instead of at our own home on the weekends. One day after we had made a good bit of progress, we decided to step back and admire our hard work. 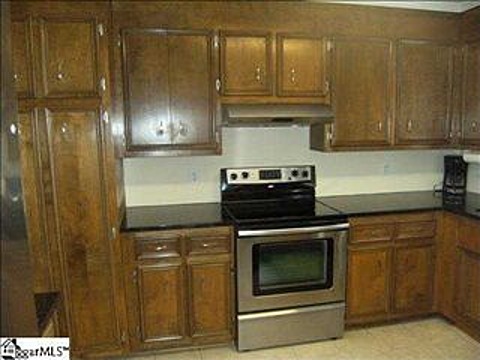 That’s when we decided that we didn’t like the direction we were going in and all of the bottom cabinet bases would have to be re-painted. Womp, womp. We still need to finish priming the insides of the cabinets, add a second coat to everything, and then prime and paint almost all of the doors and drawers (plus paint over the blue that’s still on the pantry). Unfortunately for us, Mother Nature has decided to be a bit moody this weekend and we’re worried that it’s a tad too cold to paint in the garage where all of the doors are currently living. Hopefully we’ll be done soon and I can show you a good before and after! 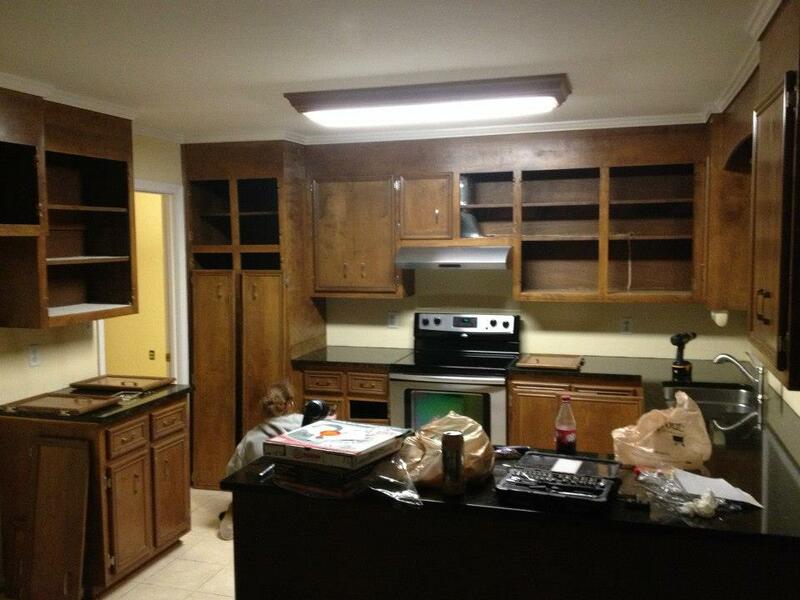 I think it already looks a hundred times better and the light cabinets make the space feel so much bigger. So, have any of you tackled a project like this? Was the outcome worth all of the work and waiting? …all of them minus one to go. 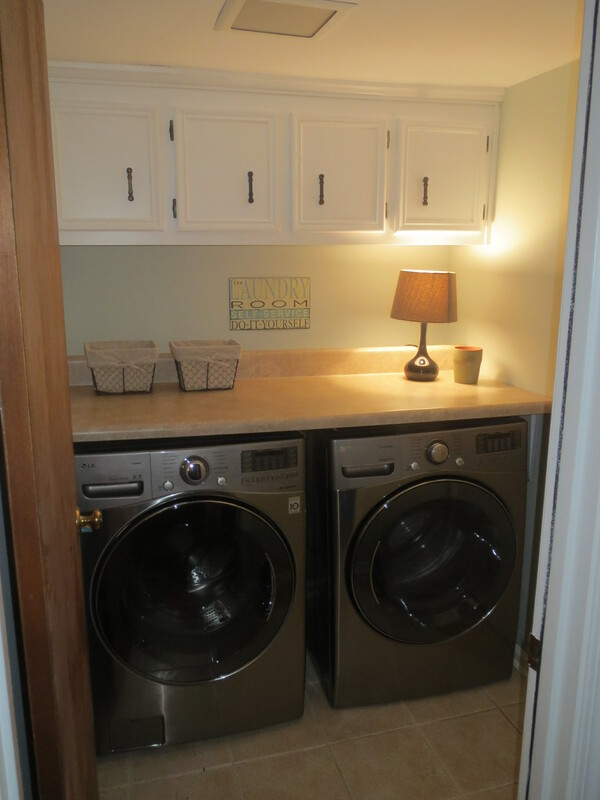 One of the very first rooms we started working on in the house was our laundry room. This is the place where we access the garage from the house so we knew we wanted it to be a functional space for both washing clothes and storing our keys/sunglasses/random assortment of daily items. I really love how it turned out and it didn’t take much effort or money. 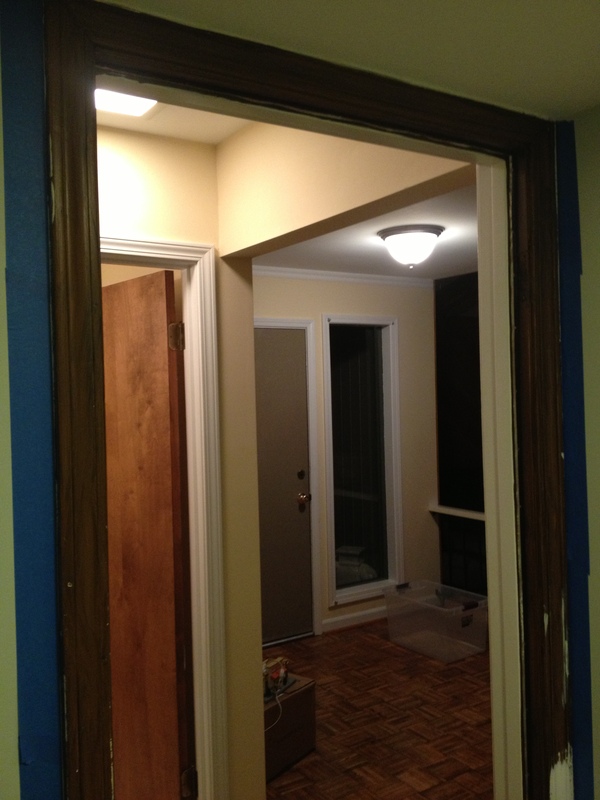 We painted the cabinets white and the walls a calm grayish blue color (Sea Salt by Sherwin Williams). 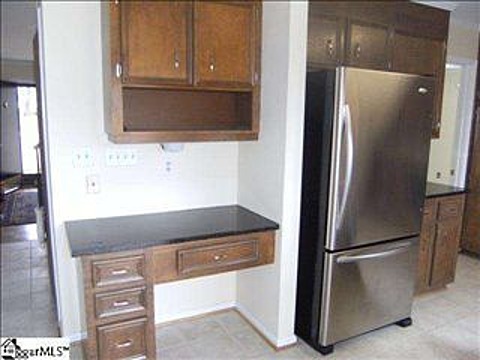 It feels so much more pleasant and clean now than it did with the yellow/beige that was there before, don’t ya think? We also added a counter ($60 for 6ft at Lowe’s – cut to the size we needed), a couple of his and her baskets for keys and mail, and a lamp from Target. The small green container is an old vase we’re using as a trash bin for lint and random pocket junk. I say it didn’t take much effort but to be completely honest, I only did the painting. My dear, sweet husband installed the counter and let’s just say I heard more than a few grumbles and five dollar swear words coming from behind closed doors. Since this is my very first post, I’d like to tell you a little bit about who I am and a little more about the house Kyle and I fell in love with. Let’s start with little ole me, shall we? I’m an early twenties Southern gal married to a guy born and bred in the great white North. In terms of design and decor, our styles may not always mirror one another’s but we know how to compromise. I enjoy having my steady desk job but I get most of my excitement from crafting, baking, and most recently from designing and decorating every last inch of our first house. Speaking of the house, let me introduce you – but first I have a secret. Our house is an ugly duckling. Phew, glad that’s out of the way. Allow me to explain. I love our house – major L-O-V-E, but as a proud homeowner I have to be able to see my house as it is, not just how I would like it to be. We got a crazy good deal on this baby. 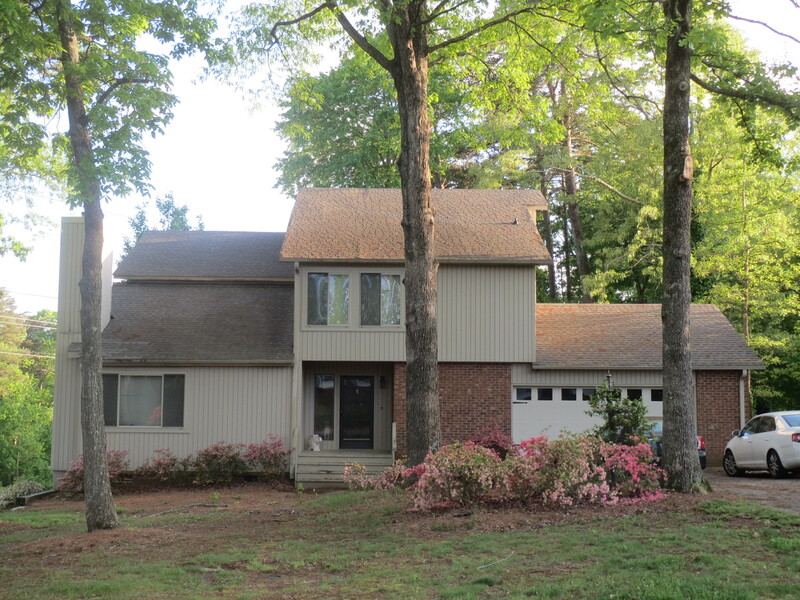 She’s a 1970’s 4 bed, 2.5 bath, 2600 sqft contemporary style with a lot of potential that was on the market for quite some time. 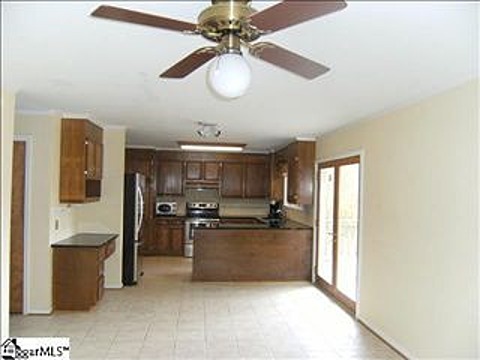 The inspection gave us no reason to fret and the appraisal came back solid. A few people have wondered why nobody else snatched up such a great opportunity and I often reply “Oh who knows, maybe it’s because the lighting was bad in the photos” or “Could be the fact that our neighbors are actually power lines.” Deep down inside, I know the answer. She. Is. Ugly. The house is just not the most attractive from the outside – not a ton of curb appeal. But c’mon, people! That can be changed! Even if she’s not currently the prettiest girl at the ball, she’s my baby and I love her. We have some major plans to make her inner beauty shine on the outside but since the trees here grow leaves instead of money (ugh, I know right? ), we’ll be taking on small projects little by little. I hope you stick around to see what we do with the old girl!